A number of Egyptian parliamentarians have tabled requests to “punish” their controversial colleague Tawfik Okasha for inviting Israel’s ambassador to Egypt to a private meeting in his home to discuss “several local and regional issues”, state-owned Ahram Online reported. The Members of Parliament have requested that Okasha be referred to an ethics committee or for him to be stripped of his membership altogether, Ahram Online quoted novelist MP Youssef El Qaeed as saying. Israeli ambassador Haim Koren had visited Okasha’s home in Daqahliya last week, where the two reportedly discussed a variety of issues, including the Palestinian-Israeli conflict and the construction of the Grand Ethiopian Renaissance Dam (GERD). 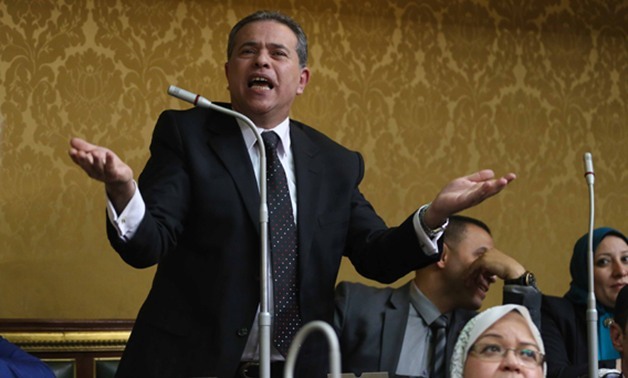 At Sunday’s parliamentary session, MP Kamal Ahmed also reportedly threw his shoe at Okasha as the latter entered the hall, prompting parliamentary speaker Ali Abdel Aal to expel both MPs from the session. Meanwhile, Egypt’s Boycotts Divestment Sanctions (BDS) campaign slammed the parliamentarian’s actions as a “normalization” of Egyptian-Israeli relations and a “crime against the Egyptian people”. In a statement posted to its Facebook page, the campaign noted that Okasha’s “unprecedented” move to invite Koren to a private meeting contradicts the controversial parliamentarian’s usual stance on Israel. Okasha’s invitation was a surprise to many – including the Israeli ambassador – particularly as the parliamentarian and TV host has been highly outspoken against a “Zionist conspiracy” against Egypt and has frequently referred to the January 25 2011 revolution as a part of said conspiracy. Although Egypt was the first Arab country to establish diplomatic relations with Israel with the signing of the 1979 Camp David peace treaty, many Egyptian politicians have taken a stand against the further normalization of relations with Israel.